1. Motherhood has taught me that it’s a true gift and to never take it for granted. I was a teen mom which many frown upon. Not ideal, but God gave me that beautiful baby and I don’t regret it for a single moment. 2. Motherhood has taught me patience and the true meaning of unconditional love. 3. Motherhood has taught me to view the world with a fresh perspective, as seen through the eyes of my daughters. So innocent and positive. As adults we sometimes lose that. 4. Motherhood has taught me to be selfless. There were times when I needed or wanted things, but I didn’t get them because my children’s needs have always come first. I always want them to have better than I have and do better than I do. 5. Motherhood has taught me the importance of instilling moral values, respect for others and discipline into my girls. So many of these things get lost in the shuffle of today’s busy world. Nothing makes me more proud than to see my girls growing up with such structure. It’s very rewarding to know we taught them such things. 6. Motherhood has taught me not to judge others so harshly for how they are handling their own children. We all parent differently and there isn’t just one “right way” of doing it. Again, they don’t come with instructions. As parents, none of us are perfect. 7. Motherhood has taught me that I am valuable, needed, and has shown me my main purpose in life. To teach them kindness, compassion and 10,000 other things they will need to know about the world to make them great people. 8. Motherhood has taught me that it is possible to be totally frustrated and at your very breaking point with a person and in the very next moment gushing with love for them. We have all been there. I can’t tell you how many times I’ve had to go into the bathroom, lock the door and cry my eyes out. Even just for 15 seconds until they find me again. And when they do, and I see their faces, I’m all better. It’s a vicious cycle..
9. Motherhood has taught me that things cannot always be perfect. A girl can dream. Sometimes you can’t dictate your day as you wish and that the here and now is what matters. The craziness is ok! The world will not stop spinning because of it, thankfully. 10. Motherhood taught me that my children are not me. They are both individual people with their own likes & dislikes, their own ideas. My job is to give them guidance, but in the end I have to allow them to be who they are and accept them no matter what and just love them. I mess up more as a parent than I ever imagined, but I know at the end of the day my kids love me and I love them. No crazy day or new situation that we have to face will ever change that. Everyday is a new adventure full of learning for all 3 of us and I couldn’t imagine it any other way. If we don’t learn and grow then what is the purpose of living. 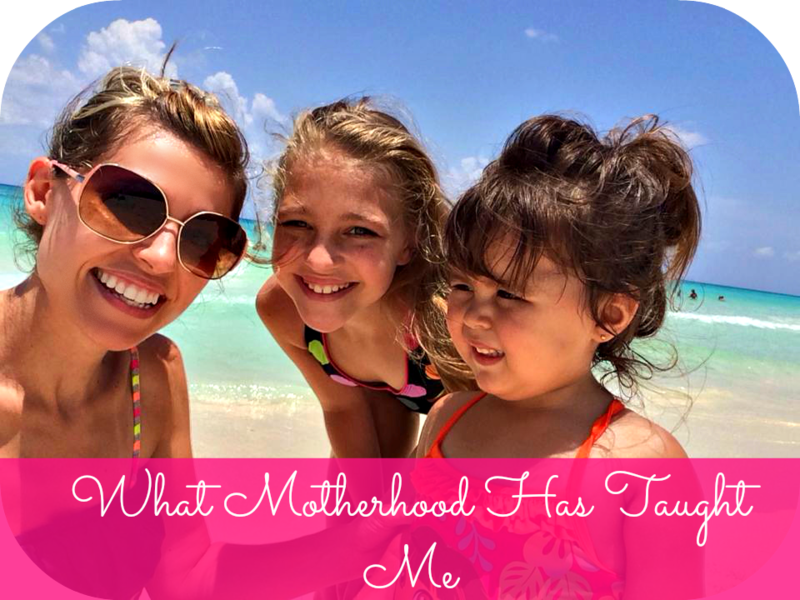 So now I am curious, what has Motherhood taught you? I totally agree with this post, motherhood does teach us a lot, especially patience and unconditional love.